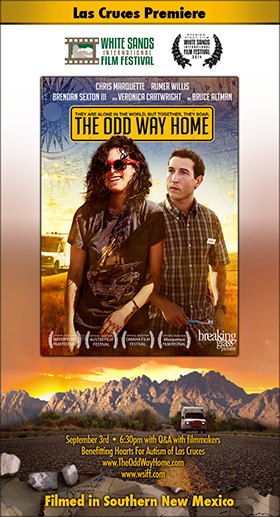 “Odd Way Home” was chosen as the opening night film for 2014 WSIFF. It was directed by Rajeev Nirmalakhandan, a professor at NMSU’s Creative Media Institute who co-wrote it with Jason Ronstadt. The film stars Rumer Willis, Chris Marquette, Brandan Sexton III, Veronica Cartwright and Bruce Altman. Pretty sure I might end up annoying one or more people with what I got to say about the films that ended up winning the awards. I’ll say congratulations to the winners even though I don’t think One Armed Man, Universal Language or Moses on Mesa deserved the awards they got given. Now I may not know anything about making movies or writing them but I got a pretty strong sense of whats good. For my money, DOLLAR NIGHT and NO LOVE LOST were the two stand out films in all the short films. There was nothing original or new about the winning films. Dollar Night and No Love Lost had real originality in style and cinema. No Love Lost shook things up and had me on the edge of my seat. Dollar Night was emotionally a period piece and far out better than One Armed Man or Moses on the Mesa. It’s a shame to think that in it’s tenth year the WSIFF could not choose to have a more international jury rather than a national jury to reflect its status as an International Film Festival. Thank you for reading and commenting. And for attending the festival. This year’s selection of films was a different mix than years past. I myself did end up wishing that a few more films did receive more recognition than they received. The thing about movies is that they are received differently by all the viewers. That’s the beauty of it too. I didn’t get to watch all of the selected winners, but I was rooting for several other choices myself. Ultimately I am very glad to have had the opportunity to see so many different independent films this year and will carry the gems I found in my memory! Thanks for your remarks Focused Filmographer. I would like to add a couple of more cents worth – I feel that WSIFF should recognise ‘Dollar Night’ and ‘No Love Lost’ in some strong way. Neither film has left my mind and I have tried hard to find flaws when comparing them to the run of the mill winner ‘Universal Language’. Just can’t help thinking both of those films and their filmmakers were snubbed.